Gift vouchers can be purchased in any amount from £10. Your voucher will be e-mailed to you with in 24 hours, please print and follow the instructions on the voucher for use. 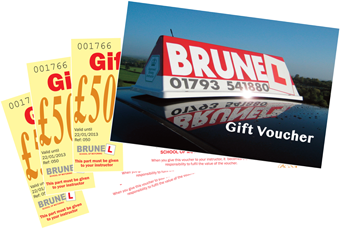 It can be used for normal driving lesson payment or towards any driving school offers through Brunel School of Motoring website. Please note; Gift vouchers are non-refundable only valid for 12 months from date of issue and a charge of 2% will be added to cover VISA/MASTERCARD surcharge.